Shimoda Air Force has come up with a new way to create great music via online collaboration – while using their art to make a positive difference on the other side of the world. Brian Weingartner of Shimoda Air Force explains how it all started in this interview. What is Shimoda Air Force? 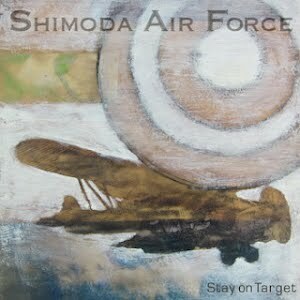 Shimoda Air Force is a two-person band featuring Brian Weingartner and Josh Kross. Our influences include Wilco, Radiohead, WEEN, Miles Davis, and The Hold Steady. We are pretty much a recording project because Josh lives in New York City and I live in Philadelphia. Josh and I have been friends for decades and SAF was born out of our desire to make music together even though we lived several hours apart. We share our recording files over the internet, making the recording process pretty flexible for us, and we have been able to give each other a lot of creative freedom to experiment with song writing and arranging, as well as recording techniques. Since we are rarely in the same room together when recording we have learned to trust the judgment of the other person, in a way that is completely different than any bands we’ve either been in before this. I understand that SAF has an innovative revenue model, where your listeners themselves decide how much to pay for your music – and you are using 50% of your proceeds to make loans to Zidisha entrepreneurs. Why did you decide to involve Zidisha? This was really a multi-step decision on our part. After our debut EP “Stay On Target” had been on iTunes, Amazon, and Spotify for a year we were faced with the decision on whether or not we wanted to take a chunk of our profits to re-up with those services. When it came down to, it just seemed like a waste of money, and that there was something better we could be doing with that money. While having our music available on the big sites was cool, it ended up seeming like more of a status symbol to us instead of a sound business decision, especially because we are a small independent band. We also did not like having no control over what to charge for our music. We love making music, we love sharing the music we make, and any money that comes from this process is a bonus to us. Once we made the decision to move forward with our music only on BandCamp and have the pay what you want model, we next came to what to do with the money we already made, and what we would do with the money we might potentially make. We decided we wanted to help make a difference in the world, and thought about a number of charities we would like to support. We ran into the issue that we would most likely be making a one time donation, and due to the amount of money we would be donating, make a relatively small impact. This led us to consider micro-lending. Picking the right micro-lending organization was more complex than we anticipated. After considering several bigger names that turned out to lend with extremely high interest rates, we decided on Zidisha. Zidisha provided us with a great opportunity to make a large impact on someone’s life, with our relatively limited profits, as well as the ability to roll over our loans into new loans as they are paid back. Once we figured this all out we became really excited about the prospect of being able to help multiple people with the same funds. How have your listeners responded to the chance to support Zidisha entrepreneurs with their purchases? We certainly have had several people express interest in what we are doing with the proceeds, and the feedback we have received has all been overwhelmingly positive. We chose not to hit people over the head with our decision to get involved with Zidisha with music that had been out for a year already. We have a new release coming in 6 months or so, and we plan on hitting the micro-lending aspect of what we are doing much harder with that release. We really hope that the positive interest we have received so far translates into a greater impact for our Zidisha lending. What is your favorite Zidisha entrepreneur story? Josh has had the opportunity to make loans to a lot of people, as he seems to always pick short-term loans that need a little money to finish. His favorite, however, has been a larger loan to Yacine Moustatpha Gueye in Senegal. One of the most interesting things about the loan process has been her constant updates about what she’s doing and where she is doing it. She has posted about many other women she works with, and has kept us with updates about how the holidays and seasons are affecting business. This gives a much better insight into the help we are giving the borrowers. Posted on November 22, 2013 by Julia Kurnia. This entry was posted in Uncategorized and tagged entrepreneurship, microfinance, p2p lending, social business. Bookmark the permalink.